On song: Emily Herbert from St Elizabeth’s School, Tarragindi; Darcy Rofe from St Agnes School, Mt Gravatt; Charlize Van Buren from St Pius X, Salisbury; and Zoe O’Neill from St Bernard’s School sing the praises of Catholic Education Week and the Year of Youth. CATHOLIC school students from 304 schools across Queensland heeded Pope Francis’ message to young people at the 2016 World Youth Day during this year’s Catholic Education Week celebrations. Drawing from the words of Pope Francis in Krakow two years ago, where he told millions of young people to stop being couch potatoes and live a life of mission, Catholic Education Week focused on the theme, Discovering New Horizons. The theme asked school communities to consider new ways of spreading joy through learning, emphasising the importance of Catholic education in Queensland. The official launch of Catholic Education Week was held at St Anthony’s Catholic College, Deeragun, in the Townsville diocese. Townsville Catholic Education executive director Jacqui Francis said there was “a real buzz” around the schools in the diocese. The celebrations also offered a chance for schools in the diocese’s regional areas to showcase their role in providing education to students in remote suburbs. “As hosts of the state-wide launch in Townsville, our students are encouraged to feel connected to the Queensland Catholic Education community during this important celebration of the mission of our Catholic schools,” Ms Francis said. 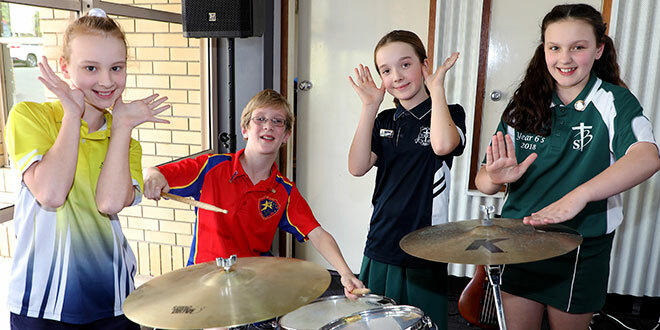 During celebrations in Brisbane, students answered the Pope’s call to find new ways of spreading joy with an uplifting concert by MusicFire, a band comprised of talented Brisbane Catholic Education staff. Hosted by St Bernard’s Primary School, Upper Mt Gravatt, students gathered for an opening prayer, introduction and words of encouragement from Brisbane Catholic Education executive director Pam Betts before the concert. Ms Betts told the primary students there was no better way to celebrate our faith than through music. “It was a wonderful celebration of young people who participated so joyfully,” she said. During the celebrations, students took time to reflect on how they could discover new horizons and spread joy in the world. They also presented generous donations of toiletries and household items to assist migrant and refugee families in the communities of St Paul’s School, Woodridge and St Brendan’s School, Moorooka. Queensland Catholic Education Commission executive director Dr Lee-Anne Perry said the week-long celebration highlighted the many shapes and sizes of Catholic schools – from small rural schools to large metropolitan colleges, from boarding schools to flexi-schools for disengaged students. “They are all unique, but they are also bound together by a common mission to make a difference in the lives of students, and in the wider community, by challenging young to reach their full potential as compassionate, contributing, life-giving members of society,” she said.